How do you open that wall in your home to incorporate a folding sliding door? The first thing that you need is an opening to accommodate the door. The opening must be of sound structure to allow the door to be installed correctly. Also note that the space will require a recessed bottom sill. The next step is to measure your opening. This must be done from side to side and from subfloor to header. It is advisable to use laser level to check the opening as an opening that is not level and plumb can effect your measurements and installation. 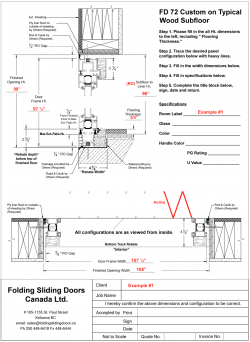 Below are detailed drawings to help you plan and measure your opening for a Folding Sliding Door.